So my friend just randomly invited me to watch this movie with her, and it was quite a while ago, so I can’t remember everything as clearly. But here is a review, I think this movie is actually worth a review, recommended for everyone in the family. Fun fact, before the movie start they showed a video of Justin Bieber singing “Santa Claus is coming to town”, I almost went out of the theatre when that happened. However in this movie, they’re giving out a message to everyone, perhaps all the kids who still believe in the magic, to not lose faith in this obese man dressed in red climbing down your chimney. So the story follows the same old routine, an ordinary guy, who is probably labelled as ‘useless’, having a little special thing in him that no one discovered. He is Arthur, the son of the current Santa Claus, and his job is just to read and reply all the mails sent in by children for Santa. Perhaps that’s what made that special part inside him alive, reading all the innocent letters sent in by the children around the world made him believe in what’s right about being Santa. All those wonderful elves that seems more like secret agent than elves. 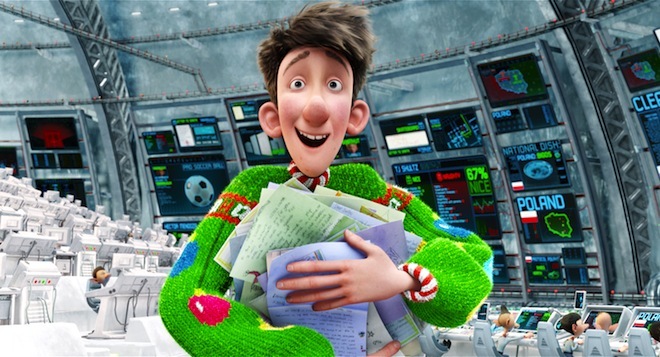 The movie displayed a very different perspective of Santa, such as the high-tech spaceship that travels at extremely fast speed(can’t remember the specific speed), and deliver presents to all the children in the world with the help of elves that should probably work as secret agents instead of giving presents. Then a child was left out due to a mistake, the part of this movie that brought up the question – does one single child really matters? The answer the movie gave is, yes, of course it matters. The reality side of this movie is perhaps Arthur’s exceptionally capable brother, who made the entire delivery process during christmas high-tech, and determined to become the next Santa Claus, also, Santa Claus himself, who lost his passion for being Santa, and fell asleep without any problem despite knowing a child was left out, then the father of Santa, who was also the former Santa, who only wanted to show his grandson that he is still capable of being Santa. It showed the ugly side of people who only want to become something for that certain title, like someone who wants to be a doctor but doesn’t have the determination to heal and cure people from their illness. The movie is filled with passion, at a good pace, the climax of the movie had a lot of action packed, with Arthur, his grandfather, a gift wrapping elf, and a few reindeer pulling a sleigh named Eve across the sky with the help of magic dust. At the end of the movie, like all animation for everyone in the family, Santa himself, his father and Arthur’s brother Steve saw that bright smile on Arthur’s face when Gwen opened her present, and agreed that Arthur is the person who should become Santa, in order to bring joy to every child in the world. Why is this movie worth watching? It’s one of those movie that keeps your dream, your hope for humanity and the world alive. It tells a story about a useless guy who has a wonderful good intention becoming a respectable figure who bring happiness to everyone. Despite being slightly predictable and cliché, unlike most Disney movies filled with unique surprises and deeper messages, it’s worth watching simply for the fact it’s a movie that NEEDS to be watched during the festive season to get the atmosphere alive. You might say those who still believes in Santa are naïve, but admit it, you wish you’re still naïve, and someone makes that effort to keep your dream alive. ‘Cause admit it, having a dream really does feel magical. The next movie I want to watch is We Bought A Zoo, I can’t seem to resist movies based on true stories, like The Blind Side, and I love animals, I really do, so I suppose I’m going to like a story about a group of people trying to keep a zoo alive in order to save the animals. I’m not sure is New Year’s Eve worth watching, it seems like one of those movie they invite a long list of celebrities just to make sure there are people who actually watch it. Which reminds me, Valentine’s Day kinda sucked. Oh well that’s all, I’m sorry I haven’t been updating, I’ll try to update more often~ Next post should either be The Muppets review, or EOY review, or maybe, just maybe, a year review.